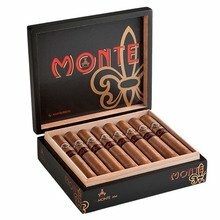 The Monte by Montecristo Conde is a modern, soon to be classic version of this legendary premium brand. This large Corona features an old Cuban style pig-tailed cap. The signature feature is the use of two binders, a spicy Dominican Olor combined with a strong and aromatic Nicaraguan Corojo. This double leaf paired with an oily Ecuador Habano wrapper offers a solid construction and a bold refined taste. The Conde is offered in boxes of 16. Very flavorful smoke! Notes of coffee leather and chocolate for me. The draw was a tad on the tight side but none the less a tasty stogie. Smooth medium brown wrapper, very even and attractive. Not toothy or oily. First third of cigar is spicy and rich. Lots of smoke with a hint of chocolate aroma. Burns evenly and the first ash fell at about an inch, not great but sturdy enough. Middle third calms down on spiciness and gets even richer. Creamy and much sweeter than it began. Last 20 minutes are a challenge to smoke slowly. Burns evenly but draw is a bit difficult. This is a very potent but rich and smooth. Its almost dessert-like in its character. Lots of nicotine and full flavor. Excellent cigar for the price. Literally the only Monte Cristo I would give 5 stars to! This thing was a surprise and a half! Leathery earthy flavor is abound, with some great spice, and a nice smooth finish. Just smoke this yesterday and I must say I was really impressed. The flavor was fantastic it burned nice and even and slow. Tons of smoke draw was a little though the first quarter but after that it was great. Really great cigar one of my favorites. Love this Montecristo Conde pigtail. Has really nice chocolate undertones the expresso and coffee taste is wonderful has a little bit of Earth Eunice to it really great smokes wonderfully. A solidly constructed, medium to mild bodied, spicy smoke. The draw ended up being perfect and the burn was even & consistent. Awesome smoke. Was one of my favorites for the longest time. Smooth smoke, lots of flavor, medium/full body. Good choice for any smoker. 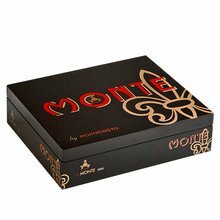 The Monte by Montecristo conde starts with a nice little blast of spice which fades allowing really enjoyable flavors to come through, I get hints of chocolate, toast, and leather, but very well balanced, as I smoke, the smoke becomes smooth and creamy, and a slight sweetness shows up. No burn or draw issues. Consistency, consistency, consistency that what take this cigar apart from any other . One can never go wrong with this cigar. Wow, this smokes as good or better than many more expensive smokes! I found an aged five pack and they were terrific. Straight burn, easy draw, good flavors that varied throughout. Aged tobacco for sure.